Paper on ‘Smartphones, Sampling and Multi-tasking’, presented at Console-ing Passions, 2015. ‘Bodies, Limbs and Intermediary Entities in Sarah Browne’s Work’, NECS: European Network for Cinema and Media Studies, 2017 Conference, Université Sorbonne Nouvelle – Paris 3, 29 June 2017. ‘Smartphones, Sampling and Multi-tasking: Observing and Choreographing Women’s Work’ (on the work of Sarah Browne and Wendelien van Oldenborgh), Console-ing Passions: Rebooting Feminism, Dublin, June 18-20, 2015. ‘Altered Physicality in Contemporary Art: Histories and Practices’ College Art Association 2014, Chicago, February 14, 2014. 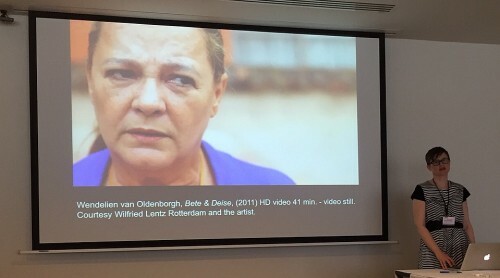 ‘Fluid Subjects, Skin, and Foreign Bodies in Recent Film and Installation’ Film-Philosophy Conference 2013: Beyond Film, University of Amsterdam and EYE Film Institute Netherlands, July 10-12, 2013. ‘Public Monuments and Landmarks as Motifs in Cinema and Contemporary Art’ Motifs of the Moving Image, IKKM, Bauhaus-University Weimar, March 28-30, 2012. ‘Artangel and the Changing Mediascape of Public Art in the UK: From Billboards to Broadcast Media and Beyond’ College Art Association Conference 2012, Los Angeles, February 24, 2012. ‘Media Citizenship, Television and the Contemporary Art Museum’ Society for Cinema and Media Studies Conference 2011, New Orleans, USA, March 12 , 2011. ‘Curating Before and After Conflict: The Prehistory of the Crisis at Project Arts Centre and Belfast Exposed’, paper presented at Conflicting Views: Visual Culture, Conflict & Northern Ireland, Institute of Art, Design & Technology, Dublin, June 10, 2010. ‘Visualizing the Viewing Public: Kutlug Ataman, Thomas Hirschhorn and the Return of the Television Audience’, College Art Association Conference 2010, Chicago, USA, February 10-13, 2010. ‘Urban Landmarks and “Regenerated Cityscapes” in Helen (Christine Molloy and Joe Lawlor/desperate optimists, 2008)’, Framing Film: Cinema and the Visual Arts, University of Winchester, UK, September 4-6, 2009. Society for Cinema and Media Studies Conference 2008, Philadelphia, USA, March 6-9, 2008. ‘Interrogating the Archive: Artists’ Cinema in Ireland’, Future Histories of the Moving Image, University of Sunderland, UK, November 16-18, 2007. ‘Of Other Worlds: Nature and the Supernatural in the Moving Image Installations of Jaki Irvine’, Screen Studies Conference 2007, University of Glasgow, Scotland, July 6-8, 2007. ‘Biennials and Blockbusters: The Peripheral Spaces of Artist’s Film and Video’, Society for Cinema and Media Studies Conference 2006, Vancouver, Canada, March 2-5, 2006. ‘Feminist Film Practice and the Formation of Irish National Cinema’, Society for Cinema and Media Studies Conference 2005, Institute of Education, London, UK, April 1, 2005. ‘Towards A Critical Context for Irish Avant-garde Film, Past and Present’, Experimental Film Today, University of Central Lancashire, Preston, UK, July 4-6, 2003. ‘Film History Out of Sync: Narrative Disruption in Joe Comerford’s Traveller (1981)’, Society for Cinema and Media Studies Conference 2003, Minneapolis, USA, March 6-9, 2003.